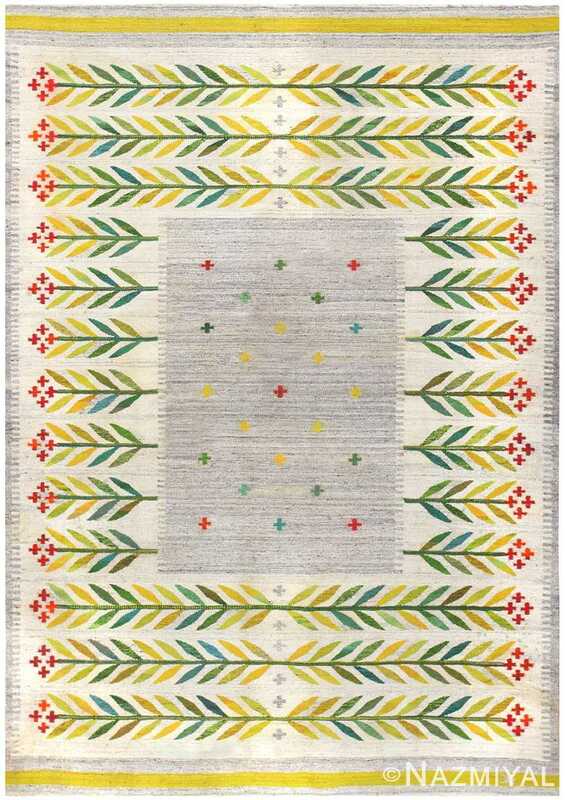 This enrapturing vintage Scandinavian kilim has an understated composition with weighted borders featuring a delightful pattern of segmented eight-pointed stars. 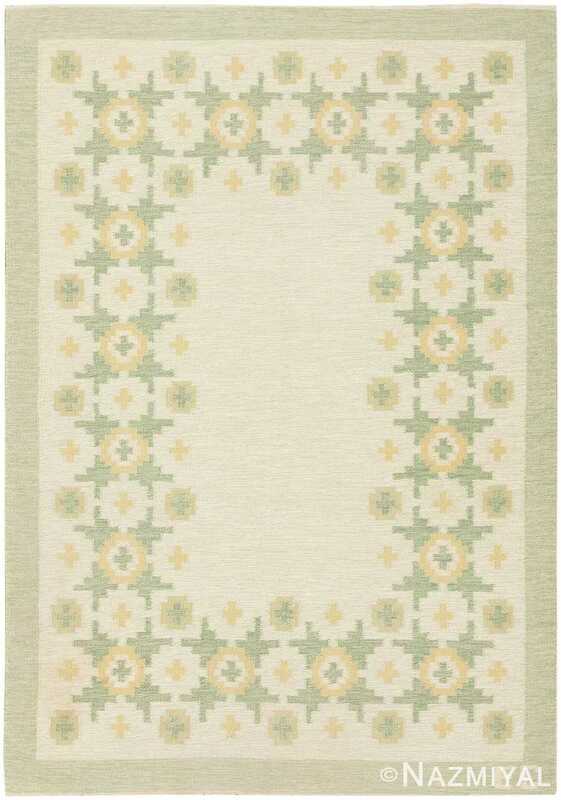 Vintage Scandinavian Swedish Rug, Origin: Sweden, Circa: Mid-20th Century – This marvelous vintage carpet from Sweden captures the essence of Scandinavian design. The understated border-focused composition on this Swedish rug features a repeating series of stylized eight-pointed stars, a beautiful and universally auspicious design, which is depicted in a sleek, modern manner. Peridot and citrine stars with cruciform centers create a phenomenal border pattern that frames a series of small-scale stars and cross-filled roundels. The traditional star motifs are rendered in a rectilinear manner that gives the figures a unique style, which complements the ancillary cruciform motifs beautifully. Minimalist celery-green outer borders frame the whimsical yet understated field, uniting the luxurious ivory ground and offsetting the charming star-motif borders. 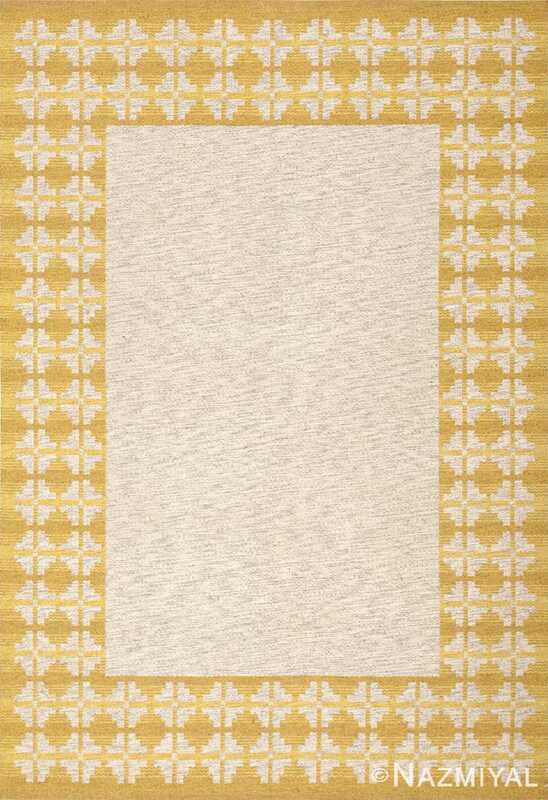 This classical Scandinavian flat-weave carpet represents the uncompromising modern style of the region along with its whimsical tendencies that are incorporated seamlessly into the most refined minimalist designs. 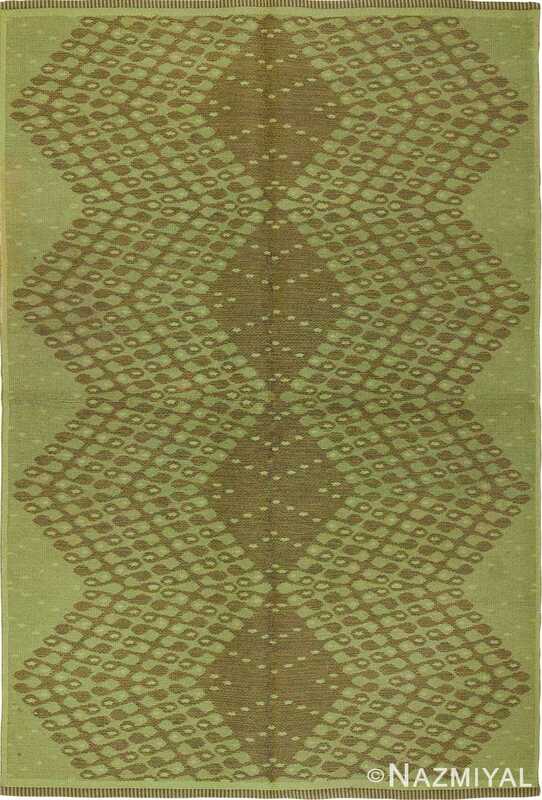 This delightful double-sided kilim, a mid-century Swedish piece, features a modern design of simple geometric figures, carefully arranged in shades of green. This gorgeous vintage Kilim from Sweden features an exceptional double-sided composition that is sophisticated, elegant and exceptionally versatile.